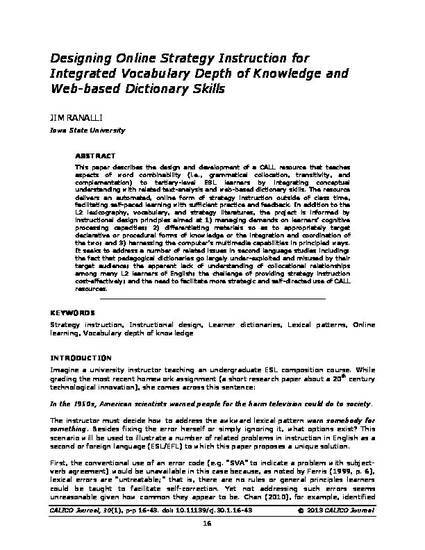 This paper describes the design and development of a CALL resource that teaches aspects of word combinability (i.e., grammatical collocation, transitivity, and complementation) to tertiary-level ESL learners by integrating conceptual understanding with related text-analysis and web-based dictionary skills. The resource delivers an automated, online form of strategy instruction outside of class time, facilitating self-paced learning with sufficient practice and feedback. In addition to the L2 lexicography, vocabulary, and strategy literatures, the project is informed by instructional design principles aimed at 1) managing demands on learners’ cognitive processing capacities; 2) differentiating materials so as to appropriately target declarative or procedural forms of knowledge or the integration and coordination of the two; and 3) harnessing the computer’s multimedia capabilities in principled ways. It seeks to address a number of related issues in second language studies including: the fact that pedagogical dictionaries go largely under-exploited and misused by their target audience; the apparent lack of understanding of collocational relationships among many L2 learners of English; the challenge of providing strategy instruction cost-effectively; and the need to facilitate more strategic and self-directed use of CALL resources. This is an article from CALICO Journal 30 (2013): 16, doi:10.11139/cj.30.1.16-43. Posted with permission.